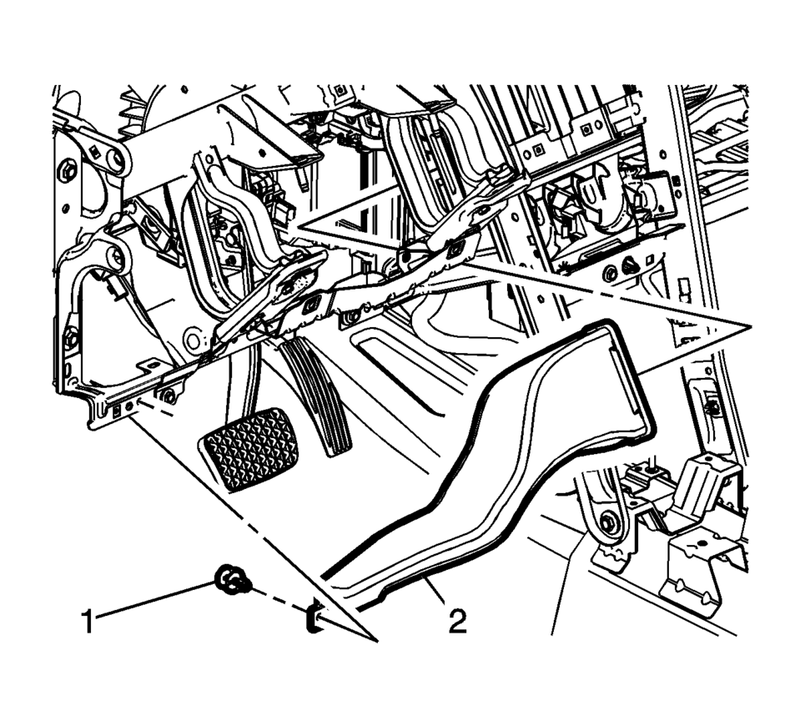 Remove the steering column and wheel from the vehicle. 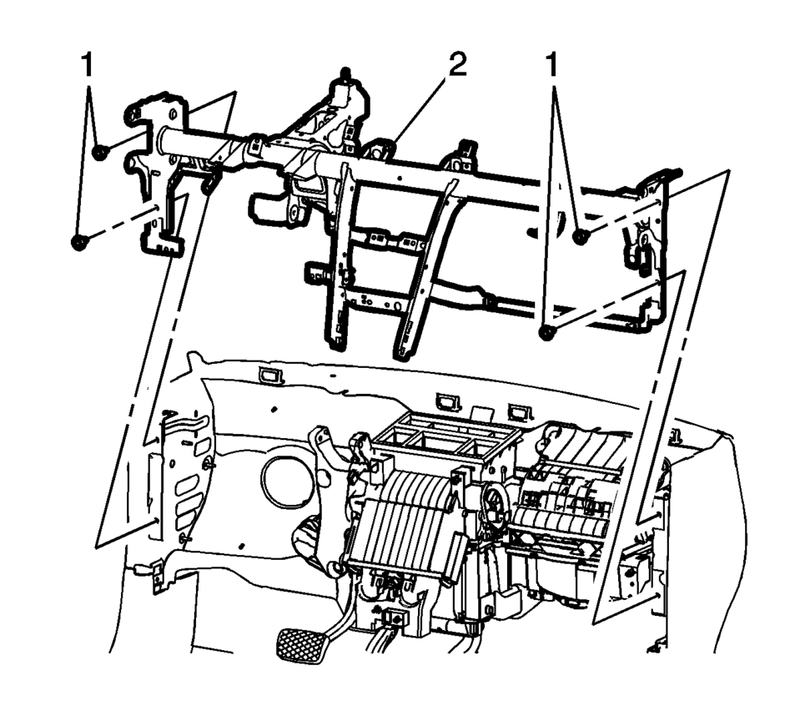 Refer to Steering Column Replacement. Remove the air inlet grill panel. Refer to Air Inlet Grille Panel Replacement. Unsnap the instrument panel fuse block (1) from the instrument panel tie bar assembly and position out of the way. Remove the push-pin fastener (1) securing the left floor air outlet duct (2) to the instrument panel tie bar assembly. 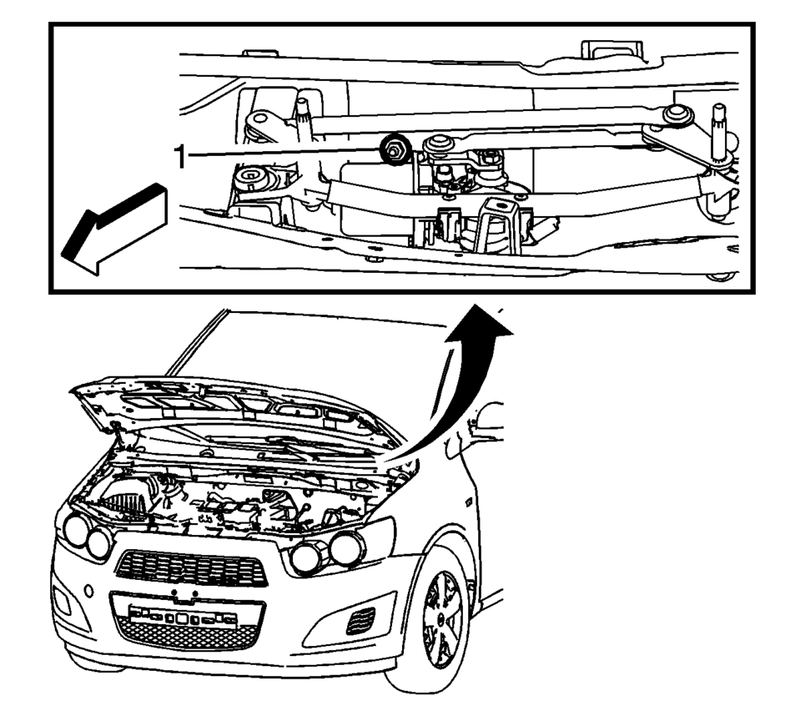 Remove the left floor air outlet duct (2) from the vehicle. Remove the nut (1) securing the instrument panel tie bar assembly to the cowl panel. Remove the bolts (1) securing the instrument panel tie bar assembly to the brake pedal bracket. Remove the brake pedal release bracket bolts (1) securing the instrument panel tie bar to the brake pedal mounting bracket. Remove the bolts (1) securing the right and left instrument panel tie bar lower support brackets (2) to the front floor tunnel panel. Remove the fasteners (1) securing the instrument panel tie bar assembly to the HVAC module. Support the HVAC Module in order to prevent damage. Remove the bolts (1) securing the instrument panel tie bar assembly to the vehicle body. Note the location and routing of the instrument panel wiring harness in order to ensure proper installation. 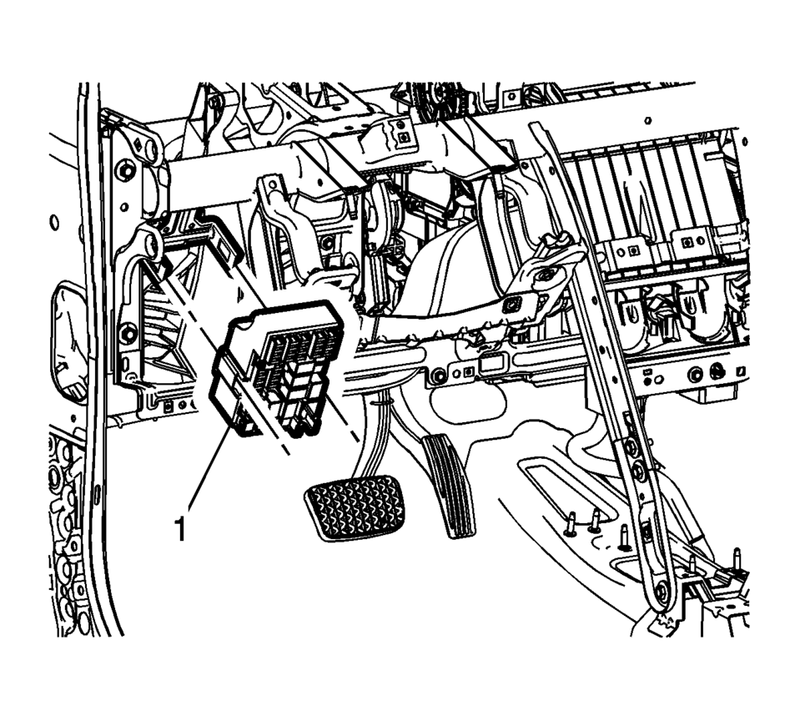 With the aid of an assistant remove the instrument panel tie bar assembly from the vehicle. With the aid of an assistant position the instrument panel tie bar assembly into the vehicle. 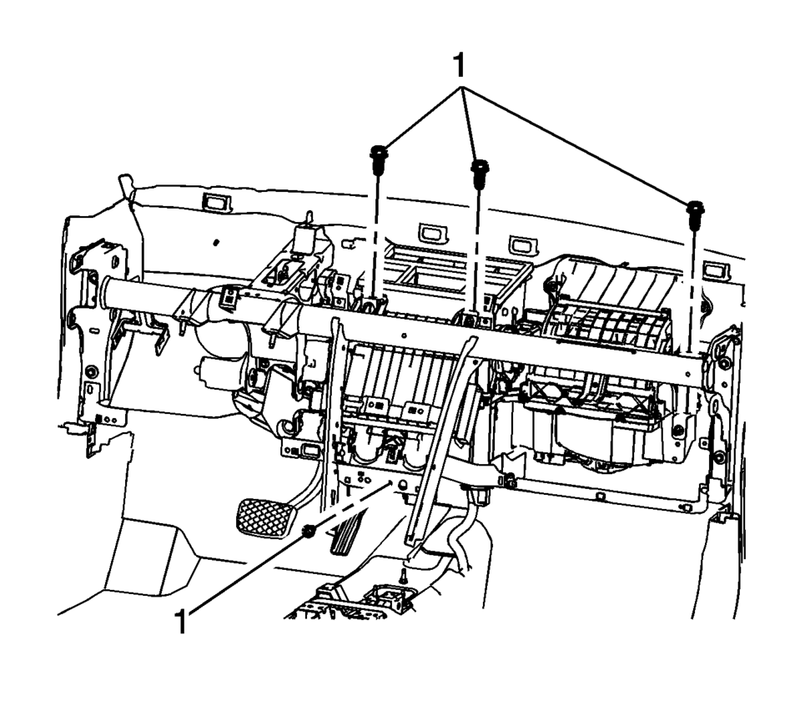 Install the instrument panel wiring harness assembly to its in vehicle position as it was noted in the removal procedure. Loosely install the bolts (1) securing the instrument panel tie bar assembly to the vehicle body. Loosely install the fasteners (1) securing the instrument panel tie bar assembly to the HVAC module. Remove the support from the HVAC module. Loosely install the bolts (1) securing the right and left instrument panel tie bar lower support brackets (2) to the front floor tunnel panel. Loosely install the brake pedal release bracket bolts (1) securing the instrument panel tie bar to the brake pedal mounting bracket. Loosely install the bolts (1) securing the instrument panel tie bar assembly to the brake pedal bracket. Loosely install the nut (1) securing the instrument panel tie bar assembly to the cowl panel. Tighten the instrument panel tie bar to vehicle body bolts to 22Y (16 lb ft). Tighten the instrument panel tie bar to HVAC module fasteners to 9Y (80 lb in). Tighten the instrument panel tie bar lower support bracket to front floor tunnel panel bolts to 22Y (16 lb ft). 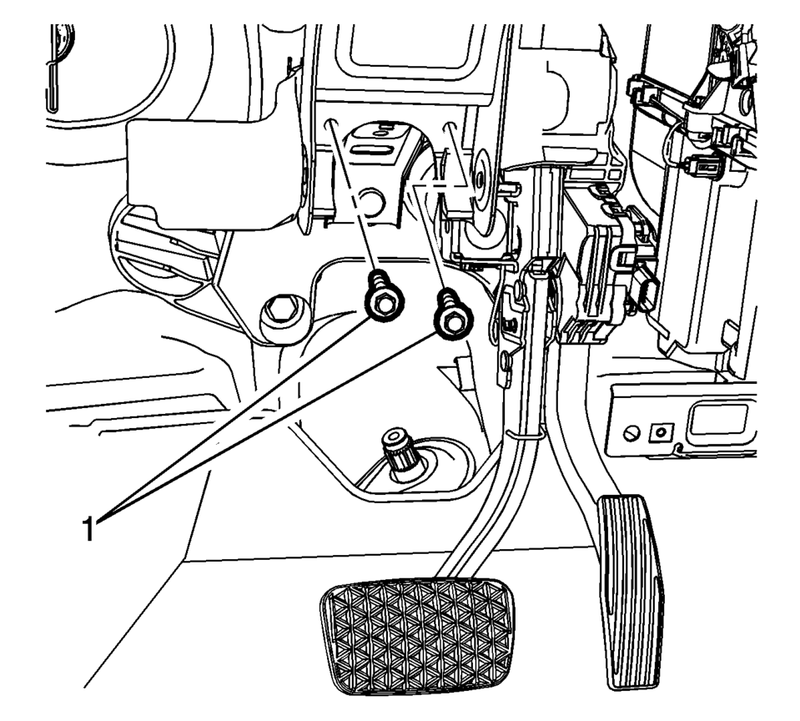 Tighten the instrument panel tie bar to the brake pedal release bracket bolt to 22Y (16 lb ft). 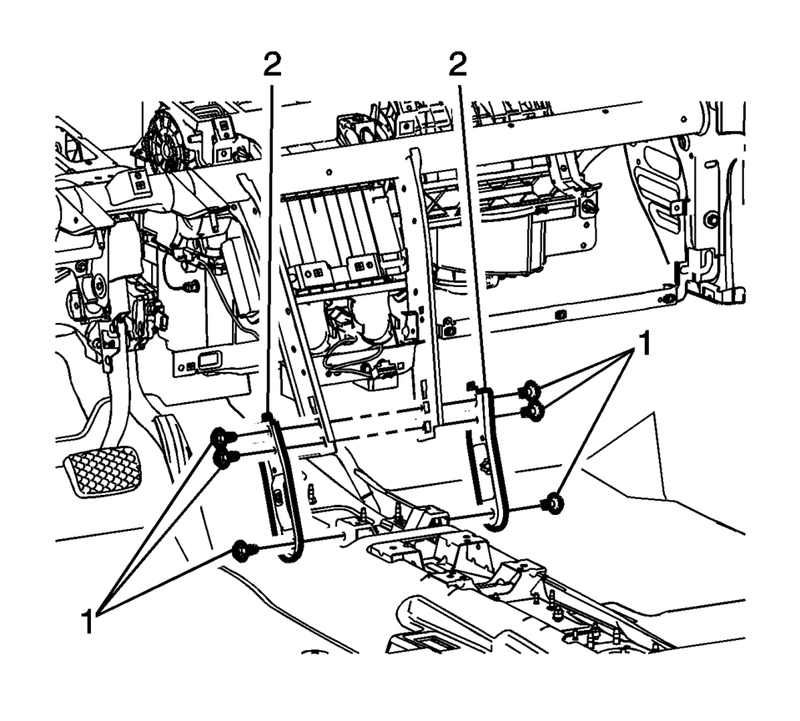 Tighten the instrument panel tie bar assembly to the brake pedal bracket bolts to 9Y (80 lb in). Tighten the instrument panel tie bar assembly to the cowl panel nut to 22Y (16 lb ft). Install the left floor air outlet duct (2) into the vehicle. Install the push-pin fastener (1) securing the left floor air outlet duct (2) to the instrument panel tie bar assembly. Snap the instrument panel fuse block (1) onto the instrument panel tie bar assembly. Install the air inlet grill panel. Refer to Air Inlet Grille Panel Replacement. Install the steering column and wheel from the vehicle. 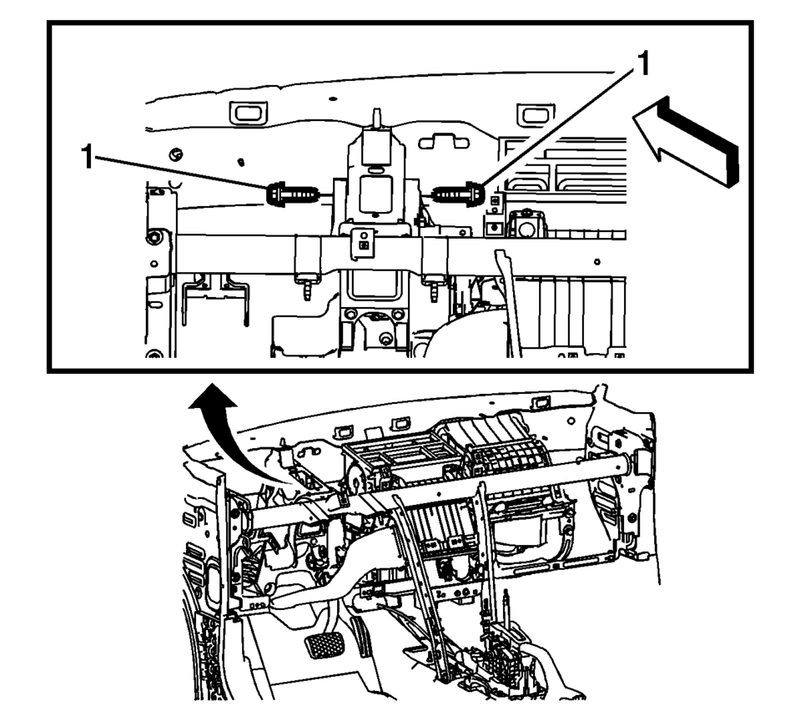 Refer to Steering Column Replacement. Install the Instrument panel assembly. Refer to Instrument Panel Assembly Replacement.